My herb garden is bigger than I have ever seen it. Guess I can blame all the rain for that. But I don't mind the over abundance of herbs at all , I am just so happy summer is here again. I've missed being in the garden, barbecuing and dining outside. Here are two easy recipes that take mere minutes to put together. The first is a orange infused steak that quietly marinates all afternoon allowing you to tend to the garden. 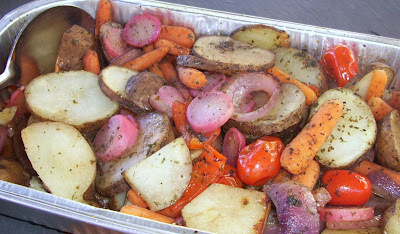 The other is an easy side dish that throws together easily and cooks without much tending to allowing you to relax on the patio. You can vary the vegetables and seasoning amounts to suit your taste. I love easy summer living...lets just hope we stop getting so much rain! In a bowl mix all ingredients except meat. Reserve half for later. Place meat in a ziplock bag and pour in half of the dressing. Seal and rotate and flip bag to mix well. Place in fridge for at least 2 hours to marinate. Grill steaks to desired preference. Slice against the grain and place on platter on arranged orange slices. Pour reserved dressing over top. In a disposable aluminum pan toss everything together until well coated. Seal with foil and place on top rack of barbecue set medium high until tender. (about half an hour) Mix halfway through.